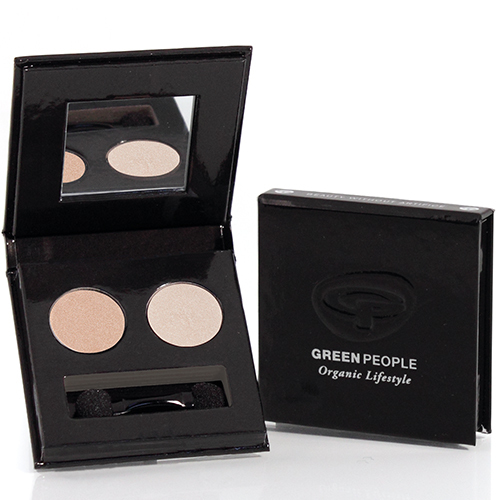 Green People Organic Eye Duo contains the light-reflecting shades pearl and satin pink, with natural mineral pigment. Natural illuminating eye duo for a gorgeous, glowing complexion. Rich, blendable mineral shades for instant radiance and shimmer. Use as a 3-in-1 eye shadow, highlighter and luminescent complexion booster! Mica (Natural Mineral), Zea Mays (Corn) Starch*, Octyldodecanol (Plant Derived), Caprylic/Capric Triglyceride (Natural Emulsifier), Zinc Stearate (Mineral Binder), Glyceryl Caprylate (Natural Emulsifier), Silica, P-Anisic Acid, Cinnamic Acid, Cera Alba (Bees Wax)*, Simmondsia Chinensis (Jojoba) Seed Oil*, Helianthus Annuus (Sunflower) Seed Oil, Tocopherol (Natural Vitamin E). (+/-) May Contain: Ci 77891, Ci 77491, Ci 77492, Ci 77499 (Mineral Pigments). For best results firstly prime your eyelids, or use a concealer if you want your eye makeup to stand out even more. 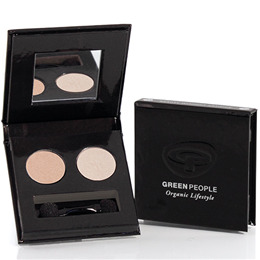 Below are reviews of Green People Organic Eye Duo - Pink & Satin Pink by bodykind customers. If you have tried this product we'd love to hear what you think so please leave a review.